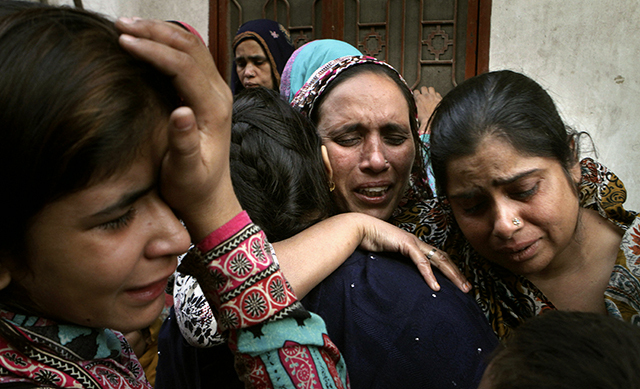 The bombing that took place on Easter Sunday in Lahore, Pakistan, was a devastating reminder that the scourge of terrorism is not confined to the recent headlines from the Middle East and Europe. Pakistan has dealt with multiple extremist insurgencies over the last couple of decades, with a variety of groups operating in the area, including the Taliban, Tehrik-i-Taliban (Pakistani Taliban or TTP) and most notoriously, al Qaeda and its former leader Osama bin Laden, who was killed by U.S. special forces in Abbottabad in 2011. A Pew Research Center spring 2015 survey found that Pakistanis were extremely critical of these terrorist organizations and supported government action to fight extremists. And they were also much more confident in the ability of the Pakistani government, led by Prime Minister Nawaz Sharif, to tackle extremist groups than they were in 2014. Overall, Pakistanis had a very negative view of the Taliban and the TTP. (The Lahore bombings were carried out by a TTP splinter group, Jamaat-ul-Ahrar, and the TTP were also perpetrators of a horrendous massacre in a public army school in Peshawar in late 2014.) In the survey last April, 72% had an unfavorable view of the Taliban umbrella group, while six-in-ten had negative opinions of TTP specifically. About half (53%) of Pakistanis viewed the Afghan Taliban negatively and 47% voiced dislike for al Qaeda. Most Pakistanis do not have an opinion of Lashkar-e-Taiba, the group that carried out attacks in Mumbai in 2008 and operates in the disputed Kashmir and Jammu area, nor ISIS, but among those who do, sentiments towards these extremist groups are negative. Across all the extremist organizations tested, no more than 15% of Pakistanis showed support for them, with more people in each case not offering an opinion. The perceived threat of the Taliban — not the TTP specifically — has fluctuated over the years in Pakistan. In 2009, when the Taliban controlled the Swat valley, an approximately four hour drive from the capital city of Islamabad, a majority of Pakistanis called the group a “very serious” threat. However, as the Pakistani government took action to push the Taliban back, worries diminished. But with the Peshawar school massacre and other signs of growing strength of the Taliban in Afghanistan, coinciding with the further withdrawal of U.S. troops in late 2014, worries surged and returned to their 2009 highs. In our spring 2015 survey 55% of Pakistanis said the Taliban is a very serious threat, just below the share who said their long-time rival India is a very serious threat (61%). Pakistanis are also more willing to support the army in its fight against terrorist groups in Khyber Pakhtunkhwa and the Federally Administered Tribal Areas than they were in the past. In 2015, 58% supported using the army to fight these groups, with only 16% opposed. Comparable levels of commitment to rooting our terrorists in these areas have not been seen since 2009, when the question was first asked. Additionally, in the spring of 2015, Pakistanis were confident that the government was making progress in the fight against extremists. A 56% majority said that Sharif’s government was making progress, with only 7% saying the Islamabad was losing ground and 12% saying things were about the same as in the past. As is typical of Pakistani public opinion, a quarter did not offer an opinion. Note: See here for topline results of our survey in Pakistan and methodology. Jacob Poushter is an associate director focusing on global attitudes at Pew Research Center.